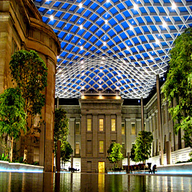 The Smithsonian American Art Museum, the nation's first collection of American art, is an unparalleled record of the American experience. The collection captures the aspirations, character and imagination of the American people throughout three centuries. The museum is the home to one of the largest and most inclusive collections of American art in the world. Its artworks reveal key aspects of America's rich artistic and cultural history from the colonial period to today.